Carolina Sporting Arms is home to a premiere 5-star indoor shooting range and retail store, catering to shooters of all experience levels who are looking to shoot/purchase pistols, rifles, shotguns and various shooting accessories, or participate in several of the training classes offered by CSA under the supervision of highly trained professionals, all within a clean, safe and welcoming environment. CSA is here to cater directly to your needs and wants to serve as the Gun Safety Hub of the Charlotte area. Learn more about our concealed carry for women. When it comes to self-defense and being the victim of a life-threatening attack, the fact of the matter is that anything can happen to anyone at any time. Nobody in this world is immune to the dangerous situations that violent people are willing to put innocent people in. Fortunately, most people live their day to day life without ever needing a firearm for self-defense, but wouldn’t you want to have peace of mind in case the day ever came when you needed a firearm for your own defense? This factor has attributed to rapid growth in people carrying legally concealed firearms and concealed carry for women, in particular. The legal concealed carry market in general, has grown dramatically in the past several years, and concealed carry for women, more specifically, has been just as big of a phenomenon. What is it, though, that makes people want to carry a firearm with them during their day to day life activities? More now than ever before, Americans from all walks of life are beginning to see the vulnerability they are in each and every day they walk out of the house. People are recognizing how beneficial it can be to carry a legally concealed firearm, knowing that they have an extremely effective way to defend themselves or their loved ones in the event that someone tries to cause them life threatening harm. Concealed carry among women has grown in particular, after women from all across the country have come to the realization self-protection is important. Many women have decided to start carrying in public and at home to protect what is most valuable to them – their children, or they may be living alone. Whatever the reasons may be, women have made the conscious decision that they are not going to be a victim. By practicing their second amendment rights, women from all different backgrounds and lifestyles are taking the measures to emerge themselves in the world of responsible gun ownership by learning how to safely and effectively operate firearms, by receiving superior training, by legally purchasing firearms and by obtaining a concealed carry permit to protect their life, personal liberties, and those who depend on them for protection. If you are overwhelmed by all of the content to learn as a beginner in the shooting world, Carolina Sporting Arms is the best place to begin your journey as a new shooter. Here at CSA, we offer a multitude of training courses that pertain to all levels of shooting experience, from beginner level, intermediate, advanced and those who are competition shooters. All of these classes are taught by highly trained NRA certified instructors, who have your safety and your learning experience in their best interest. If you are a new female shooter who is even slightly unsettled in regard to shooting and carrying a firearm, the following classes are just a select few of training classes offered by Carolina Sporting Arms, that will surely ease those unsettled nerves, and will provide you with confidence as you emerge into the shooting world and learn more about concealed carry for women. The ‘first shots’ class offered by CSA is the second step for beginner level shooters who are looking to further their knowledge in regard to basic firearms training. Unlike the ‘first steps’ course (all classroom time and NO range time), the ‘first shots’ course includes live fire training which will create a base of confidence in how to safely and effectively operate a firearm among each class participant. This particular course requires an unloaded handgun with magazines, at least 50 rounds of ammunition, eye protection and ear protection. The ‘give it a shot’ class in the series of beginner level basic firearms training classes offered by CSA is an exclusive ladies-only handgun class taught by an NRA certified female instructor. This course aims to further knowledge of how to safely and effectively operate a handgun and teaches class participants how to properly grip a handgun, load and unload a handgun/conduct press checks, utilize shooting stances and reinstates the fundamentals of basic firearms training. This particular class lasts two hours (one-hour class time and one-hour range time). Shooting targets as well as eye/ear protection will be provided for each lady participant at no fee and is yours to keep after the conclusion of the class! The entirety of this class intends to create a safe and relaxed learning environment for females who are looking to further their knowledge of firearms safety and marksmanship. The Ladies Night shooting event at CSA is a female exclusive event held on the last Wednesday of each month that is open to all women of all levels of shooting experience. The entirety of this class takes place on the range, where shooters will be able to shoot various handguns they have been wanting to try (ammo included), gain more knowledge in regard to firearms, ask any questions about concealed carry, different guns or gun issues related to women, or just enjoy a night out at the shooting range with like-minded women who have taken the initiative to prioritize how to effectively defend themselves! Ladies Night includes free eye/ear protection to keep (a $10 in store credit will be granted to those who already received free eye and ear protection in the ‘Give it a Shot’ class), one shooting target, one hour of range time, a select variety of guns to shoot (ammo included) and the presence of an instructor who will be more than happy to answer any questions. 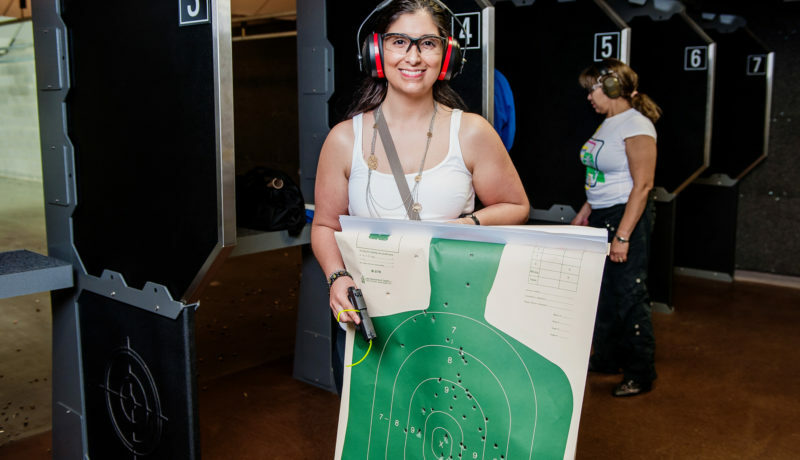 At the conclusion of the rage portion of Ladies Night, the group of women will convene in the lounge where ladies will be able to spend time socializing with fellow shooters and their instructor. It is here where handguns for concealed carry and the gun of best fit for each shooter will be discussed among the group. Carolina Sporting Arms caters several of their training classes to new female shooters who have taken the initiative to prioritize their right to self-defense. Regardless of shooting experience, safety has and will always be the top priority here at Carolina Sporting Arms, all while creating a comfortable atmosphere for all shooters and those who want to further their knowledge of responsible and effective firearms use. If you are a new female shooter who is looking to learn more about concealed carry for women, Carolina Sporting Arms is the best place to learn, practice and have fun!